The German federal election is getting closer. In the first article on this landmark political event, we explained the fundamentals behind the election. 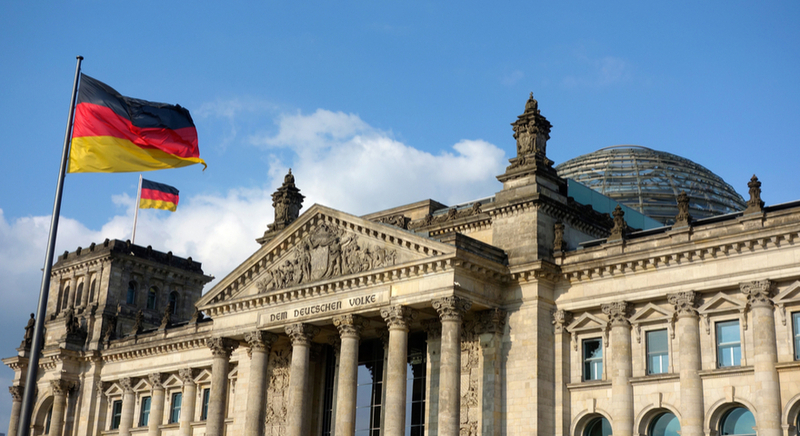 Today, we're going to explain the technical aspect of trading the German elections, including the pre-fact analysis of the DAX CFD – also known as DAX30, or the GER30 Index. Trading the news around this election may be a good possibility to make a profit on your investment. We'll be focussing on different Forex, CFD, and index trading. The DAX30 could be the most impacted market, but we'll cover other important markets, too – including gold, oil, and EUR/USD. Merkel's Christian Democratic Union (CDU) and its Bavarian affiliate party, the Christian Social Union (CSU), are looking to be the largest party according to the polls, but are unlikely to make the 50% majority. They are focussed on employment, ongoing public investment, and tax cuts. The centre-left Social Democratic Party (SPD) has been in coalition with the centre-right CDU in this current government, as well as in Merkel's first term. The SPD, led by Martin Schulz, is in second place in the polls, expected to obtain 25% of the vote, and is traditionally a working class party, focussing on education and infrastructure as well as higher taxes for the rich. The polls suggest that the Germans are content with their current government, meaning a grand coalition is likely again, happening three of the four past times. Nonetheless, there are four other main parties that can form a coalition with CDU/CSU, each expected to poll 8-10%. 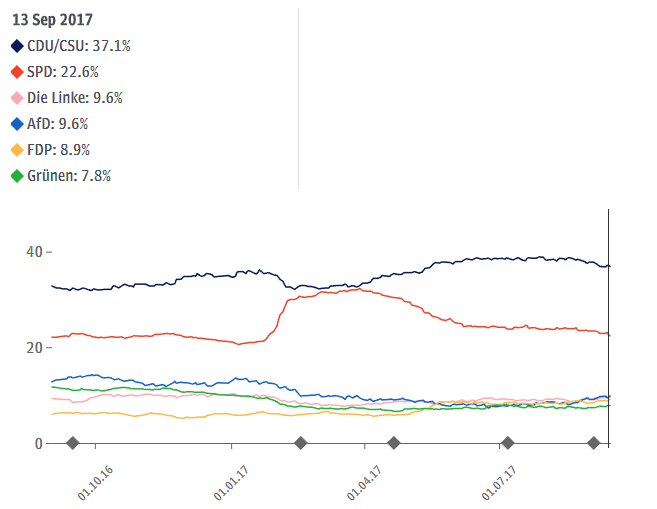 The polls have not yet shown wide variances, hence, this German election looms as a bit of a foregone conclusion. I believe the markets, like the DAX30, have largely priced in the CDU/CSU coalition. There should be no big surprises this time. The reason? Whoever wins, the German government will still be led by a pro-European politician, given that Angela Merkel's opponent Martin Schulz used to be President of the European Parliament. The DAX is a blue chip stock market German index consisting of the 30 major German companies. The DAX30 has currently retreated from the recent all-time highs in June 2017, dipping about 10% and now recovering to 38.2% Fib. As the markets have largely priced a Merkel outcome, I see the upside relating to the election win as rather negligible. However, entering a season of earnings again, I would be looking at further earnings on the DAX30. Nonetheless, a hung Parliament will cause uncertainty, potentially resulting in the drop of the DAX30; watch for a break below the 12000.00 level. For all DAX30 traders, watching and tracking price/earnings ratios is crucial. Market capitalisation of each DAX company is shown here. In German, it is called KGV. The price/earnings ratio also shows how many years of earnings it takes to pay back the price. A company with a price/earnings ratio of 14 means that it takes 14 years of earnings to re-pay the price. Remember, earnings equal the amount a company earns per year. In the case of a hung parliament, mind the Quarterly support – 11323 – as the price might easily drop. Should that happen, the price might get back in the channel and start another bearish zig-zag move. At this point, recent highs could still be good for possible shorts unless 13000 breaks to the upside. That could spur another rally towards 13420. In this case, the price is above the channel, suggesting a possible spike and retest towards all-time highs. A close back in the channel should be bearish. Gold, on the other hand, has broken its multi-year downtrend and continues to make higher lows, yet to break last year's high. Gold should increase in theory, with higher inflation and risky asset prices like equities. It is likely that the price of Gold retreats should Merkel gain a coalition majority, but again, this may be momentary, as Gold is likely to track higher with both rising inflation and equity prices. The uptrend here is intact and possible dips could be used for fresh buyers to get in a better price. Watch out for dips towards 1300 and 1275. There is a strong bullish order block there with historical buyers. A break above the channel and M H4 – 1362 could push the price towards 1400. Only a close below the channel and subsequent swings below 1260 could turn the trend to bearish on the daily time frame. Another key commodity that investors and traders tend to watch is oil given that it is a key cog to the global economy. I do not see any election outcomes that could impact this market as no parties have expressed any dramatic changes to oil taxes, or investments in environmental initiatives to reduce reliance on oil. On the chart below, we can easily identify the green channel as bullish, while a return to the purple channel should be bearish for the WTI. The EUR/USD has been one of the strongest performing currency pairs this year. The gains in the Euro came mostly on the back of speculative bets as investors are strongly inclined to believe that the ECB will be tightening monetary policy in the near term. As the market is already pricing in a possible coalition between Merkel's party and the FDP, which has a pro-business stance, the focus should shift to the ECB after the elections. The immediate impact should probably be a short-time rally followed by a sell-off and another rally (buying the dip). Should Schulz win, we could expect a sell-off followed by buying the dip, especially if he mentions public spending and tax cuts. We might see the EUR/USD up to 1.25. The unlikely scenario, in which the anti-EU populist parties win or Merkel forms a coalition with populist parties (e.g., Die Linke), could push the EUR/USD to and below the 1.15. A similar scenario could happen if Schulz forms a coalition with Die Linke (which is also unlikely). In the case of an immediate rally following the elections, a strong daily close above 1.2130 suggests a possible rally towards 1.2350 and 1.2400 in the upcoming days. Both channels are bullish and supported by a trend line that is telling us the market is not counting on any surprises this time. Risk-on/risk-off environment is also something to keep in mind. In the unlikely case of a hung parliament, some of the "side" effects besides a weaker Euro could also include halted gains in EU's economic growth, thus hurting US exports and impacting foreign businesses. The Japanese make massive carry trades by borrowing for very cheap prices and investing in foreign markets for returns in risk-on sentiments. In risk-off environments, when stock markets start to drop, they sell risky assets abroad and return foreign monies into the JPY, creating demand and strength in the latter. What also happens is paying JPY loans off. This has the effect of reducing the money supply of the JPY, causing further appreciation in the currency. That can instantly drop the JPY risk gauge pairs, such as GBP/JPY, AUD/JPY, and USD/JPY. Whoever wins the elections, have in mind that risk management remains crucial… and do not forget to use the VPS tool.